Anyhow, in CAFA2 we learned and improved; we also expanded in more ways than one. First, CAFA2 nearly doubled the number of teams and participants. We have so many co-authors on the latest manuscript (147), that I wrote a script just to manage the authors and their affiliations. 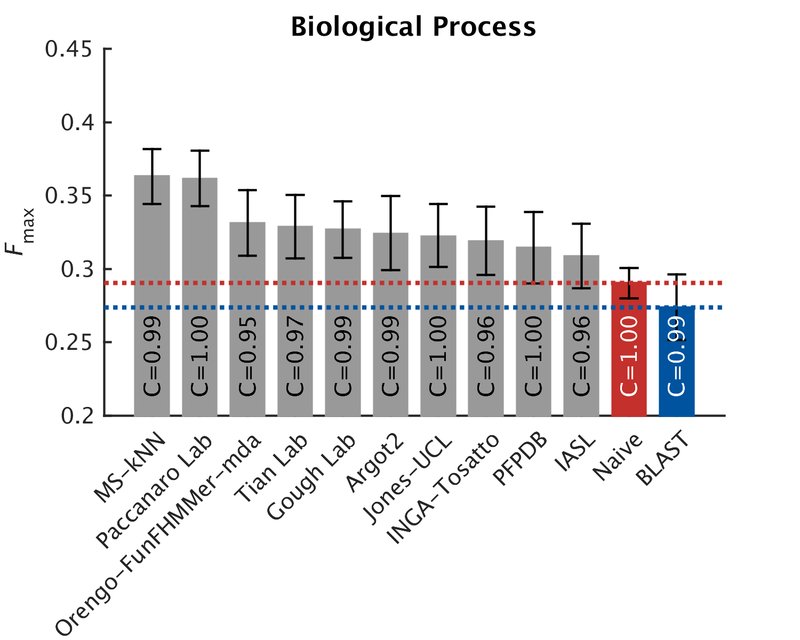 Second, we provided many more targets on which to predict: 48,000 proteins in CAFA1, and 100,000 proteins in CAFA2. 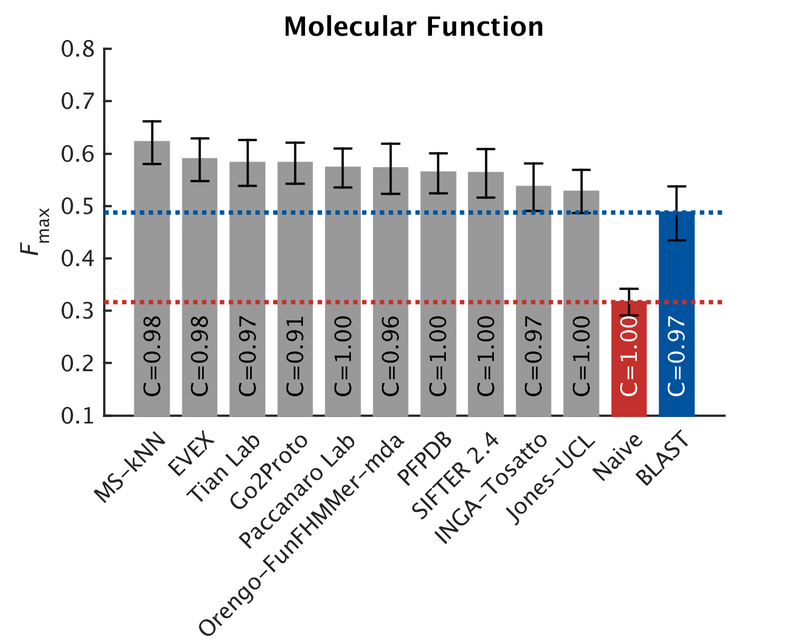 Third, we asked predictors to predict on more aspects of the function: in CAFA1 we only used two functional aspects: the molecular function and the biological process (from the Gene Ontology or GO). In CAFA2 we asked predictors to also predict the cellular component of the protein using GO terms and, for sequences from humans, also try the Human Phenotype Ontology (HPO). The HPO deals mostly with human disease phenotypes. Fifth, we used two different metrics to measure how well methods are performing. In CAFA1 we only used precision and recall. Using precision/recall, a method that preforms well will have a combination of a high number of true positive predictions out of all predictions (high precision) and a high number of positive predictions out of all those predicted to be true (high recall). In CAFA2 we also used a measure we called “Semantic Distance“, developed by Predrag Radivojac and his (then) student Wyatt Clark that takes into account how informative a term is. Simply put, if a program correctly predicts terms that are more specific (say “Protein Tyrosine kinase activity”) than others (“Kinase activity”), that program will score higher. Semantic Distance also weighs the predicted terms by how much information they carry, so just predicting “Protein binding” (20% chance of success, remember?) will not get you far using Semantic Distance. Sixth, we worked with biocurators, who provided us with some target proteins. Biocurators are the people who manually annotate proteins in databases . The databases that are monitored and populated mostly by biocurators (like SwissProt) are considered to be of much higher quality. For CAFA2, we had a team of biocurators lead by Rachael Huntley from EBI (now at University College London) with Maria Martin, Claire O’Donovan, and others provide us with many high quality annotations for human proteins that we used to challenge the participants in CAFA2. There are many other interesting things: we assessed similarities between methods based on their predictions: which methods were most similar to each other? Why? We also looked at what are the functions that methods can best predict, and how well they can do that, we call it term-based prediction, as opposed to protein-centric prediction in which a a program is judged by how well it can assign a function given a certain protein). Finally, to crown it all, we also ran a head-to-head analysis, pitting the top 5 methods in CAFA1 against the top 5 method in CAFA2. 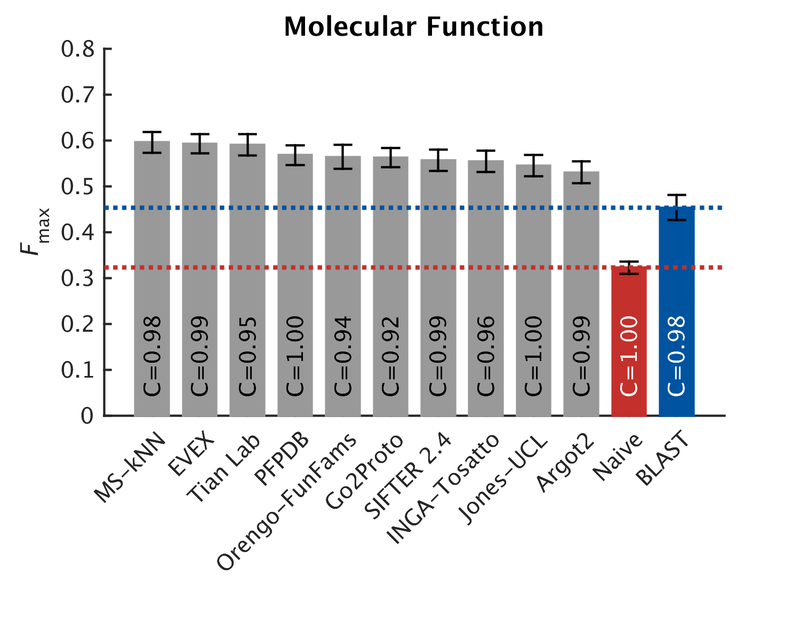 As in CAFA1, the top performing methods worked best in the molecular function aspect. Predictions of the biological process the protein participates in, or the cellular compartments it inhabits, were not as good, with biological process being the hardest to predict. The slideshow (click) below shows how well the top-10 methods performed, on a scoring scale (Fmax) of 0-1. But good news! 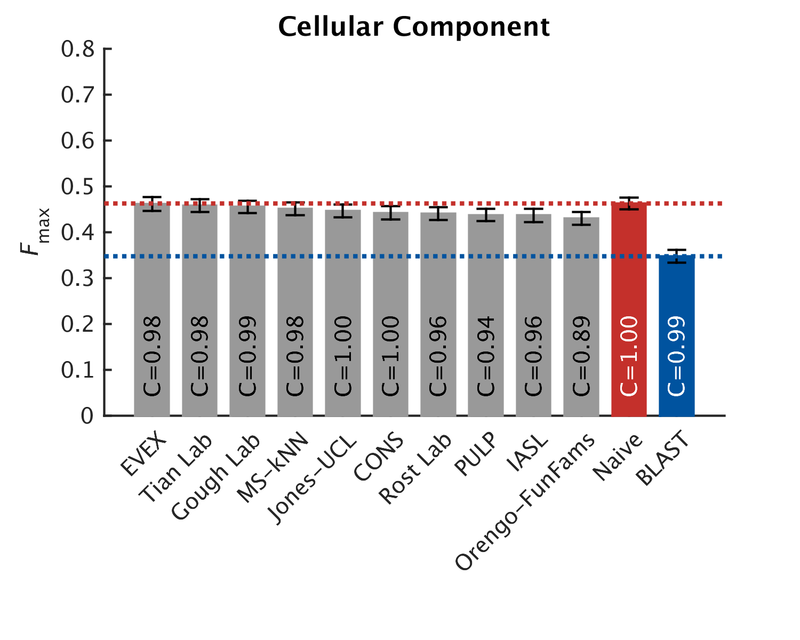 The top five methods in CAFA2 performed better than the top 5 of CAFA1, on a subset of proteins that is common to both challenges. This means that the ability to predict protein function is improving in the Biological Process ontology. We pitted the top 5 CAFA1 methods against the top 5 CAFA2 methods, and counted how many times CAFA2 won over CAFA1, the numbers are in the boxes below. The greener the box, the better CAFA2 methods performed. 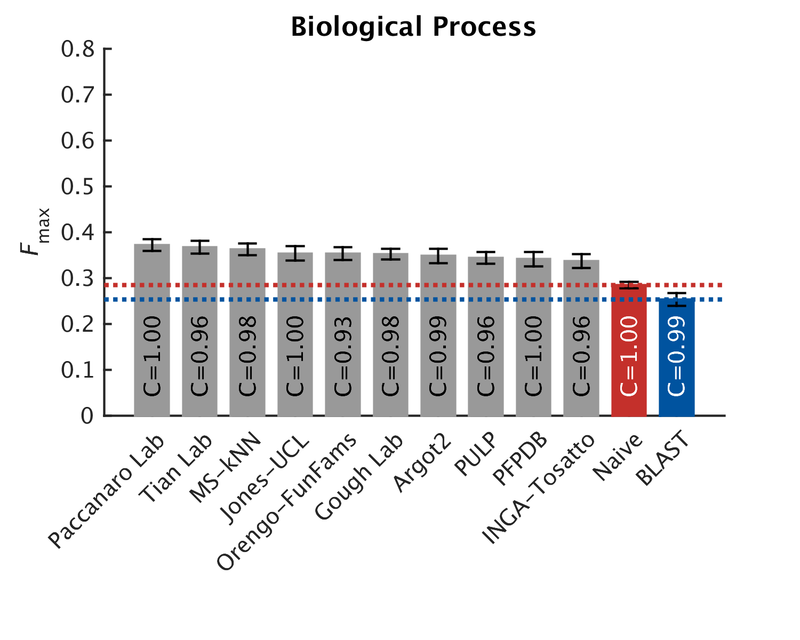 Not a single top CAFA1 method performed better than the top CAFA2 methods, which gives us hope that the field is moving forward. The predictions have especially improved in the weak suite: biological process predictions. 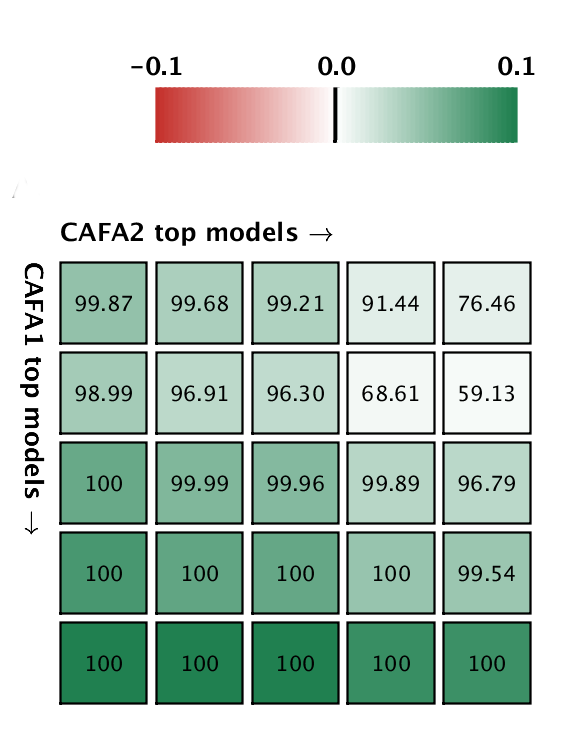 A comparison between the top 5 CAFA1 models against the top 5 CAFA2 models. 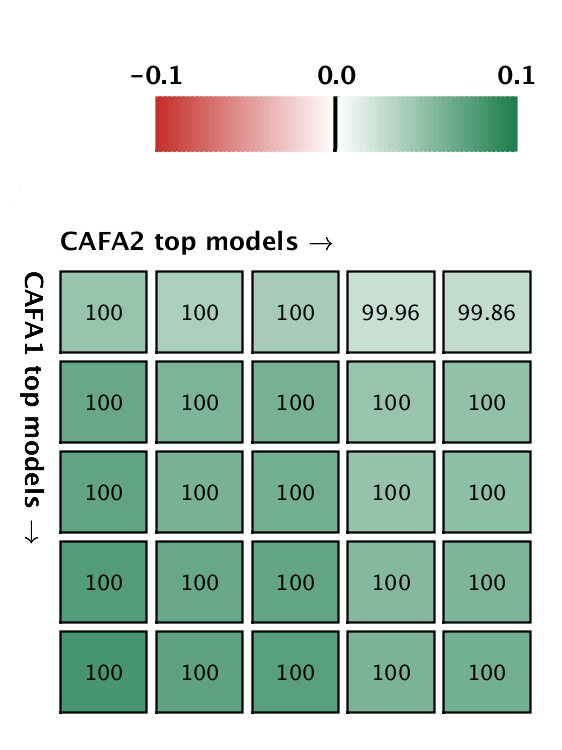 Colored boxes encode the results such that (1) colors indicate margins of a CAFA2 method over a CAFA1 method, and (2) numbers in the box indicate the percentage of wins. Top: Molecular Function; bottom Biological Process. More good news: we received funding from the National Science Foundation to continue with CAFA3, and to expand even more. CAFA3 will will start around September 2016 (fire up your computers), and will run through July 2017. We produced tons of data from CAFA2, and anyone can delve into it and analyze. There are many interesting questions that can be asked: which methods seem to correlate better than others? Which methods perform best on which organisms and ontology combination? How is the structure of GO related to our ability to predict? When do the CAFA metrics best agree on the performance of the methods they assess and when don’t they? 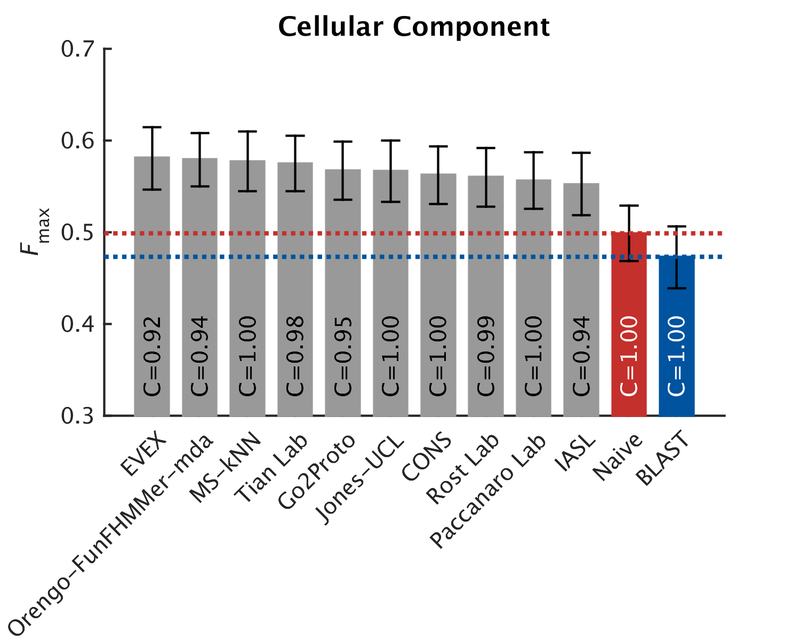 Credits: the analysis work was mostly done in Predrag Radivojac’s lab, by his student Yuxiang Jiang who is also the lead author on the paper. There are many more people to thank: Sean Mooney and Tal Ronnen Oron made sure that the website ran smoothly and that people could easily submit their predictions. A programmer in my lab, Asma Bankapur, wrote some of the analysis scripts. Anna Tramontano and her group performed some of the analyses. Casey Greene from University of Pennsylvania contributed to the analysis as well. Our steering committee, Patricia Babbitt, Steven Brenner, Christine Orengo, Michal Linial and Burkhard Rost kept us on the straight and narrow, advising us through numerous phone calls. And, of course, all the participants in CAFA2, the scientists who are working hard to improve their methods help everyone make better discoveries in life science. New September 8, 2016: The CAFA2 paper published in Genome Biology. Code used in the CAFA2 analysis. If you want to engage more, join our mailing list for news and discussions about protein function prediction, and CAFA. Categorized under: Bioinformatics, Biology, Computer Science. Tagged with: cafa, critical assessment, protein function prediction.